This is our house brand CD-R that we import for our offset printing customers. 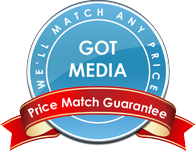 We call them Gotmedia CD-R and we stand behind these CD-Rs 100%. We feel they are an excellent value and offer qualities not available in other brands. For instance our Shiny Silver Top CD-R is hub printable, there is no stacking ring groove on the top of our CD-R. It has been used with Silkscreen printing as well as Offset printing with low reject rates due to peeling. This is the only shiny silver CD-R that we know of that doesn't have a stacking ring groove and allows you to print in the hub. You may also use these CD-R if you are applying a full face label and do not want the stacking ring to show. We also sell a White Inkjet Hub Printable CD-R if you are using an inkjet printer. Gotmedia CD-R is not only for offset or silkscreen printing, you can use these CD-Rs the same as any other shiny silver CD-R. Note: If you are using these CD-R for offset printing it is recommended that you test a small batch first. Gotmedia white inkjet hub printable CD-Rs are best suited for users that want to print on the surface of the CD-R with a color inkjet printer. These inkjet CD-Rs are hub printable which means you can print closer to the center hole covering almost the whole top side of the CD-R.
Gotmedia White Thermal CD-Rs are unique becasue they are hub printable. These CD-Rs have a smooth top surface making them great for full face labels or thermal printing inside the hub with Rimage Prism or other monocolor printers. Gotmedia Inkjet Non-hub printable CD-R disc. The Silver Inkjet surface produces a metallic or iridescent look to printed artwork. These are not hub printable. Use with a color inkjet printer or write on the surface with a CD pen.